Overview: Today's podcast is a tribute to the Italy pavilion. I take a thorough look at the design, layout, and theming. Then, I spend some time talking about shopping and dining. Its the 9th (and final) Epcot opening-day pavilion I discuss. Come and take a visit to Venice with me. Notes: Italy is unique among the pavilions, in that there is no ride or show in the pavilion. Its shopping, dining, and a couple of performers. Primarily the focus of this pavilion is its architecture and things you can see. No doubt its worth exploring, but its hard to "talk" about on a podcast. Here is an interesting factoid that I don't mention in the podcast: The statues that look like marble in the Italy pavilion are hollow. Since they were so lightweight and liable to blow away during the slightest breeze, they were held in place with rods running from their base through the hollow center. Want to take a quick photo tour of Italy? Check out my post here. 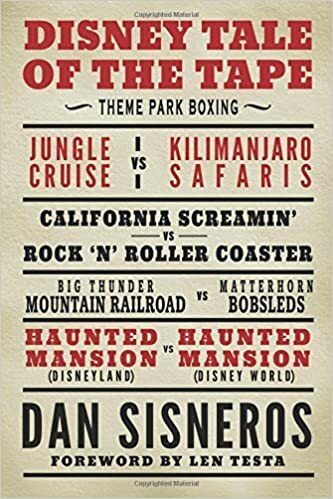 Overview: Today's podcast is all about a rather fun book called Disney Tale of the Tape, by Dan Sisneros. Essentially the book "pits" two things head-to-head and has judges compare them on various aspects. And yours truly was a judge in some of the bouts. Come and take a listen as Dan talks about the book and what it's all about. Overview: Joining me on today's podcast is Scott Shindeldecker, owner of epcotmanifesto.com. We talk all about Epcot, from its history, to what we loved (and still love) about it, to what's in store for its future ... at least as far as we know. Notes: EPCOT (in all caps) was an intriguing idea from the mind of Walt himself. Whether even he could have pulled off is anyone's guess, but what the Disney company did manage to execute was a pretty good alternative. But the world has changed, and Epcot kind of stayed stagnant, so updates and changes are probably in order. Our hope is that these changes keep the essence of what the 70s designers of Epcot had in mind. Scott's site is a blog about his perspective on the parks, and is a fun read if you are a devotee to the idea that is Epcot. It's a podcast so big it spans three regular shows in length! You won't want to miss it!